To investigate metabolic factors and their possible impact on risk of thyroid cancer. A prospective cohort study was conducted based on seven population-based cohorts in Norway, Austria, and Sweden, in the Metabolic syndrome and Cancer project (Me-Can). Altogether 578,700 men and women with a mean age of 44.0 years at baseline were followed for on average 12.0 years. Relative risk of incident thyroid cancer was assessed by levels of BMI, blood pressure, and blood levels of glucose, cholesterol, triglycerides, and by a combined metabolic syndrome (MetS) score. Risk estimates were investigated for quintiles, and a z score distribution of exposures was analyzed using Cox proportional hazards regression. During follow-up, 255 women and 133 men were diagnosed with thyroid cancer. In women, there was an inverse association between glucose and thyroid cancer risk, with adjusted RR: 95% CI was 0.61 (0.41–0.90), p trend = 0.02 in the fifth versus the first quintile, and a positive association between BMI and thyroid cancer risk with a significant trend over quintiles. There was no association between the other metabolic factors, single or combined (Met-S), and thyroid cancer. 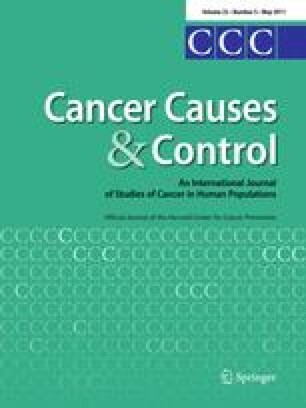 In women, BMI was positively, while blood glucose levels were inversely, associated with thyroid cancer. Financial support was provided by the World Cancer Research Fund (Grant 2007/09), The Swedish Research Council, The Ernhold Lundström Foundation, The Einar and Inga Nilsson Foundation, The Malmö University Hospital Cancer Research Fund, The Malmö University Hospital Funds and Donations, The Crafoord Foundation and the Mossfelt Foundation. The authors thank, in Norway, the screening team at the former National Health Screening Service of Norway, now the Norwegian Institute of Public Health, the services of CONOR, and the contributing research centres delivering data to CONOR; in the Vorarlberg Health Monitoring and Prevention Programme, Elmar Stimpfl, the database manager, Karin Parschalk at the cancer registry, and Elmar Bechter and Hans-Peter Bischof, medical doctors at the Health Department of the Vorarlberg State Government; in the Västerbotten Intervention Project, Åsa Ågren, the project database manager at the Medical Biobank, Umeå University, Sweden; and in the Malmö Preventive Project, Anders Dahlin, the database manager, and finally, all the study participants.